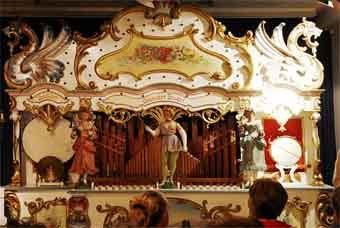 Coin-operated musical boxesIn Switzerland, coin-operated musical boxes, usually capable of playing several tunes, were installed in places such as train stations and amusement parks. Some of the models had a mechanism for automatically changing the metal disks. These were, in a sense, the precursors to jukebox. However, they soon disappeared from their intended venues and were displaced by the jukebox, which could produce a greater variety of sounds. Because most of the coin-operated musical boxes were built for rough treatment (such as typical slapping and kicking by a disgruntled customer), many of these large models have survived into the 21st century, despite their relatively low production quantities. They are eagerly sought by collectors who have the space for their large or very large cabinets.